As you get older, you ‘grow into’ certain foods – like my new love of artichokes or a preference for goat’s cheese and brie over bright orange cheddar. But there are some foods you never ‘grow out of’. In my case, this is pizza. You might remember me and Jess wandering around on the hunt for the best pizza in Buenos Aires – a place that outsiders might not realize has its very own specific style of pizza. We make a point of eating pizza everywhere we go. The thing is, in a city like New York, your pizza palate can really enjoy a range of styles, from basic slices to, well, artichokes and goats cheese (but maybe not together). So what’s the best pizza in New York City, you ask? Joe’s Pizza – thumbs up! I was determined to try them all. After spending another four months in New York City this year, I am happy to announce that the list has grown! 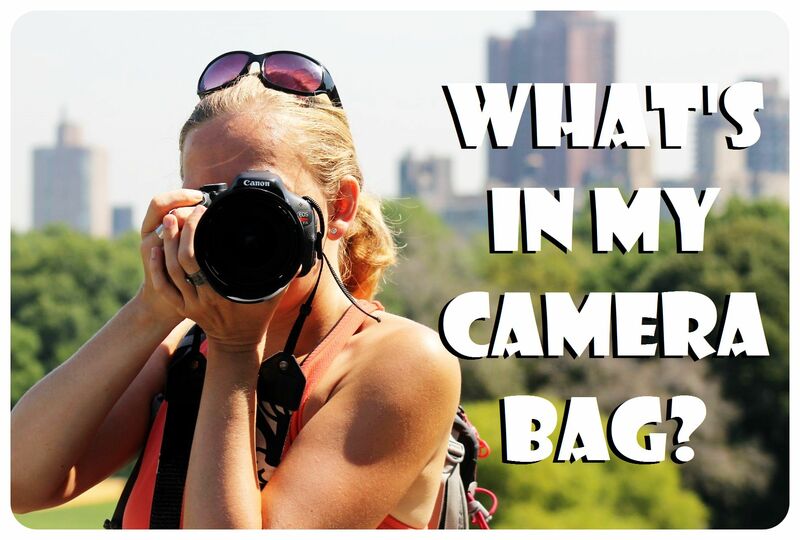 Some of these I’ve made it to, some of these places are on the list for my next summer in New York (I love summer in New York City, but I tend to stay away during the winter months…). But the more time I spend in NYC, the more recommendations I get. Speedy Romeo’s – tried, excellent! Lucali’s – tried. solid pizza but I wasn’t too impressed. L&B Spumoni Gardens – tried, loved it! Because it’s New York City, we have to talk about the $1 slice, so let’s get that out of the way first. The first slice of New York pizza we had was actually from a $1 pizza place. It is impossible to resist the smell of fresh pizza and the price… But I quickly learned that the irresistible smell and price tag doesn’t necessarily mean that it’s good (it also depends on your level of drunkenness, to be fair). It’s hit or miss with a $1 slice, and to be sure, when in need of a $1 slice I always go to 2 Bros Pizza, which is my favorite slice chain in NYC. Address: There are Dollar Pizza parlors all across New York. Check this map for a slice near you! Verdict: Excellent value for money. I continued our ‘research’ with Grimaldi’s, one of the most famous coal brick-oven pizzerias in the city and just a five-minute walk from our Brooklyn Heights housesit. I’d seen the crowds outside the restaurant on my runs, as there seem to be people waiting in front of Grimaldi’s as soon as they open and pretty much non-stop until they close, and one day we finally joined the long line of people waiting out front. Tourists flock here, so I wanted to see if the hype is worth it. Brick ovens like the one at Grimaldi’s can reach 1200 degrees Fahrenheit, which results in especially crispy and flavorful pizzas. As any good pizza would do, we opted for the classic mozzarella and cheese to absorb and compare the true flavor quality… The truth is, I expected a bit more considering the massive hype. If the line isn’t too long and you happen to be in Brooklyn, stop in for some pretty good pizza – but it’s not the best. Tip: Patsy Grimaldi, the founder of Grimaldi’s, sold his pizzeria in 1998. In 2012, he actually opened a new pizzeria right next to the famous original – his new venture is called Juliana’s. It’s supposed to be much better than Grimaldi’s, but we didn’t eat there (yet!). Verdict: If the line isn’t too long and you happen to be in Brooklyn, stop in for some pretty good pizza – but it’s not the best. As mentioned above, Patsy Grimaldi opened a new pizzeria right next door to Grimaldi’s which he sold in 1998. While the word about Juliana’s wasn’t out in 2013 when we lived five minutes from Grimaldi’s, it definitely was out in 2014, when there was always a line out the door at Juliana’s. I had a pie of the classic Margherita ($16, enough to split between two hungry or three not-so-hungry people) a couple of times and it always delivered. Definitely a notch up from Grimaldi’s – so if you find the line at Grimaldi’s too long, why not try Juliana’s instead (it’s cheaper, too!)? 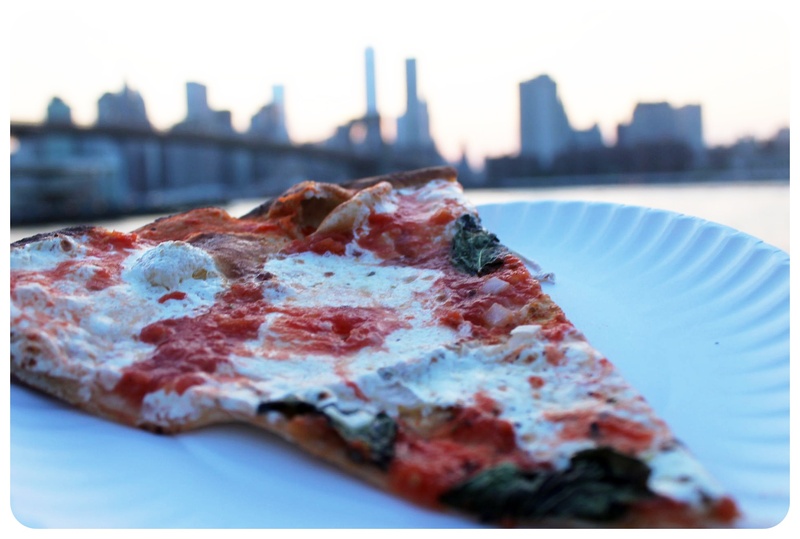 Tip: If you want to skip the line, you can just order a pizza for pick-up and eat it in Brooklyn Bridge Park right down the road, that’s what I usually do. Nothing tastes like a New York slice like a slice with the view of the Manhattan skyline, trust me! Verdict: Definitely one of the best pizzas I’ve had in New York City. It’s worth the wait, and better than Grimaldi’s next door. Paulie Gee’s wasn’t even on our list but when we made plans to meet a friend there for dinner and saw the menu, we were immediately intrigued. Unfortunately that day the wait was over 40 minutes so we skipped it, but we headed back to Greenpoint for a second go when another foodie friend was in town. Greenpoint is quite out of the way, even for Brooklyn, but it is so worth the trip! 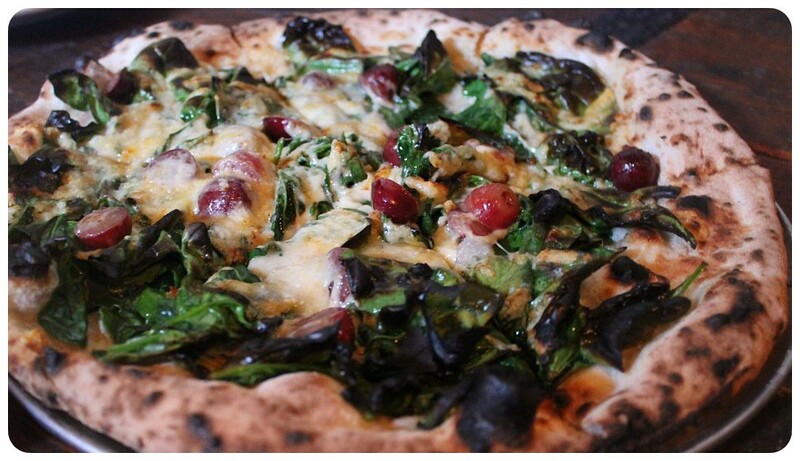 This isn’t ‘New York Style’ pizza – here you get innovative pizza creations that might sound strange at first, like the Cherry Jones – with cherries, gorgonzola, prosciutto and honey, there was one with fennel and anise, or vegan sausages with grapes. Paulie Gee’s gets extra points for awesome pizza names like Arugula Shmoogula, A Whiter Shade Of Kale or Ricotta Be Kiddin’ Me! Tip: Paulie Gee’s also has a wide range of vegan pizzas! Check out their menu here. Verdict: Absolutely delicious and if you’re into trying unusual pizzas, make your way to Paulie Gee’s! 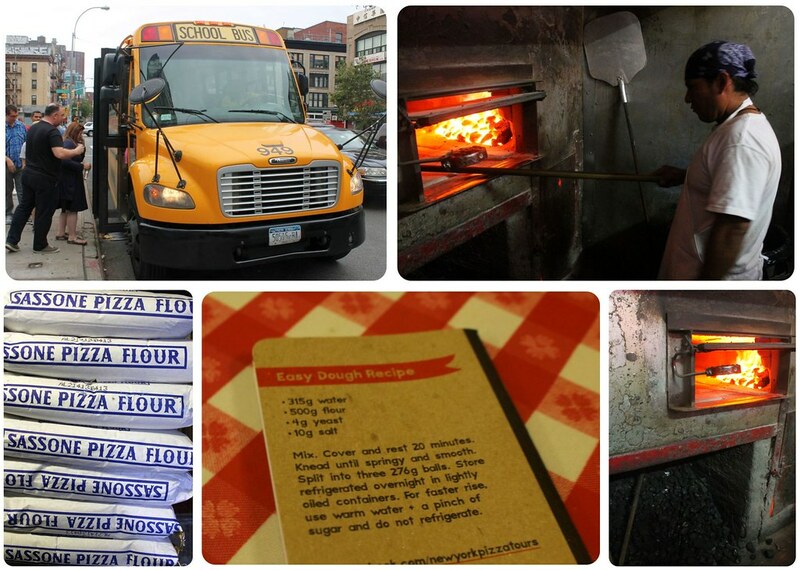 While researching for our next quick three-day stay in New York, I stumbled on a pizza tour on Vimbly. 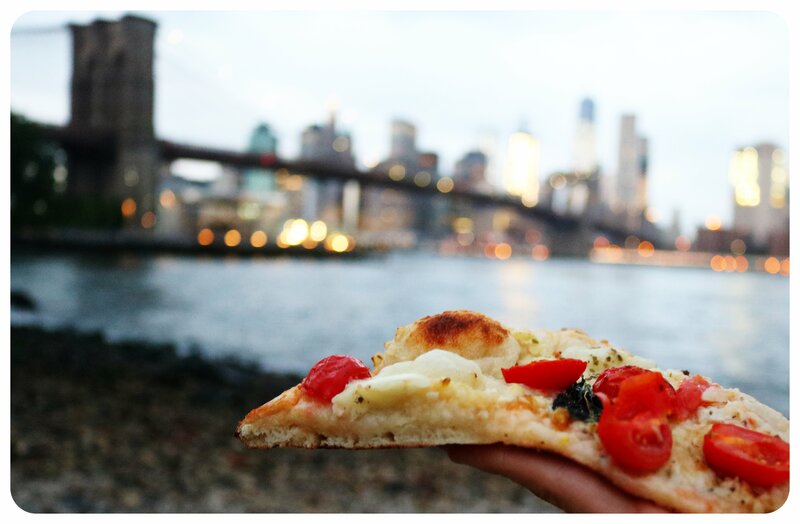 Vimbly brings together almost all the tours you can take in New York – food tours, movie tours, walking tours, kayaking tours of the Hudson River…and pizza tours! Less than 48 hours later, we were booked onto a pizza tour through four different neighborhoods with Scott, the biggest pizza aficionado we have ever met. Seriously. I was already happy when I read that the meeting point for Scott’s Pizza Tour was Lombardi’s, another pizzeria high on my list. When you roll with Scott’s Pizza Tours, Scott gets you access that you could never otherwise get. For example, the first thing we did at Lombardi’s was peek into the kitchen at the incredible pizza oven. It was lunch time and had just opened, but the brick oven has been on continuously for years – they only put the coals out entirely when they do routine maintenance every decade or so. Once you really start to pay attention to the difference between flavors of a brick oven vs a regular gas oven, you’ll opt for brick oven every time. 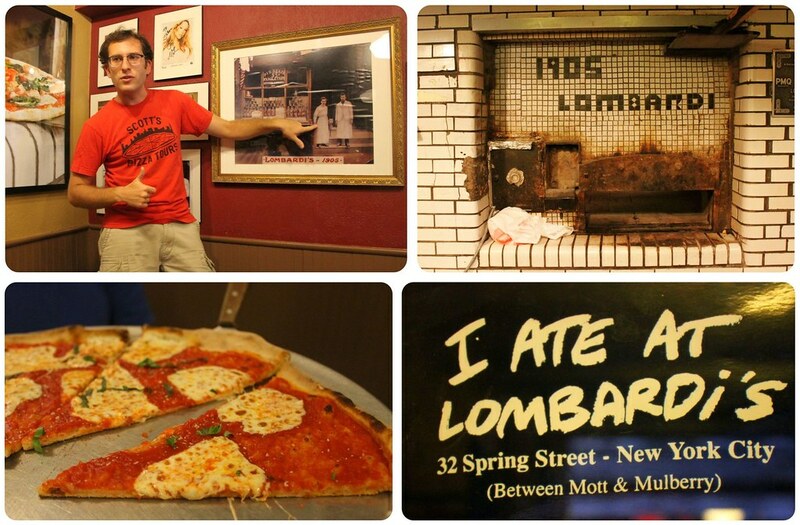 Lombardi’s was one of the first pizza places in the U.S., established in 1905 by Italian immigrants. It is indirectly responsible for the foundation of some of the best pizza places in New York: Anthony Pero of Totonno’s, Patsy Lancieri of Patsy’s and John Sasso of John’s Pizza all learned under Gennaro Lombardi, the founder of Lombardi’s. We sat down at three tables set up just for us and tried the first of four pizza slices on the tour. It was fun to see Scott geek out over the fact that you could see the brick marks in the bottom of the crust. 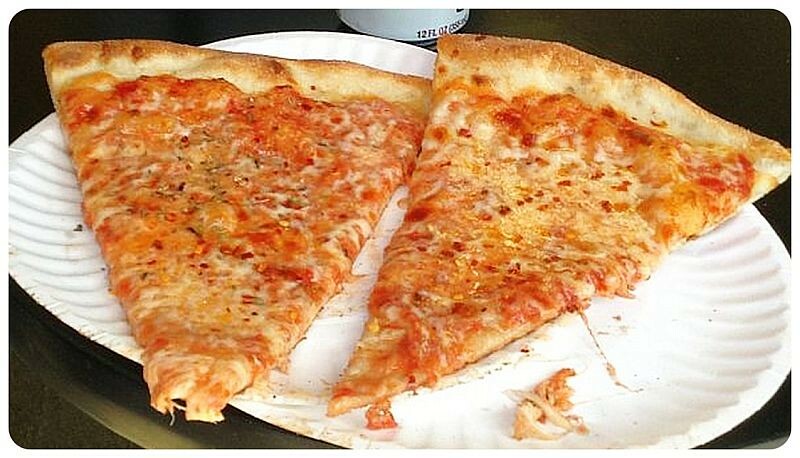 The pizza style is similar to Grimaldi’s, with melted slices of part-skim mozzarella covering the slice only partially. The sauce and cheese were better than Grimaldi’s, no question. Scott actually showed us a picture of him crawling inside that oven a few years ago! Tip: Come right at noon when they open to skip the line. We arrived just when they opened and it was still fairly quiet when we left 30 minutes later. Verdict: Decent New York-style pizza, worthy of hype. We had been told by a few New York locals that Patsy’s in East Harlem was a must, so I was happy to discover that Scott’s Pizza Tour would include Patsy’s that day and I could check another pizzeria off my list! 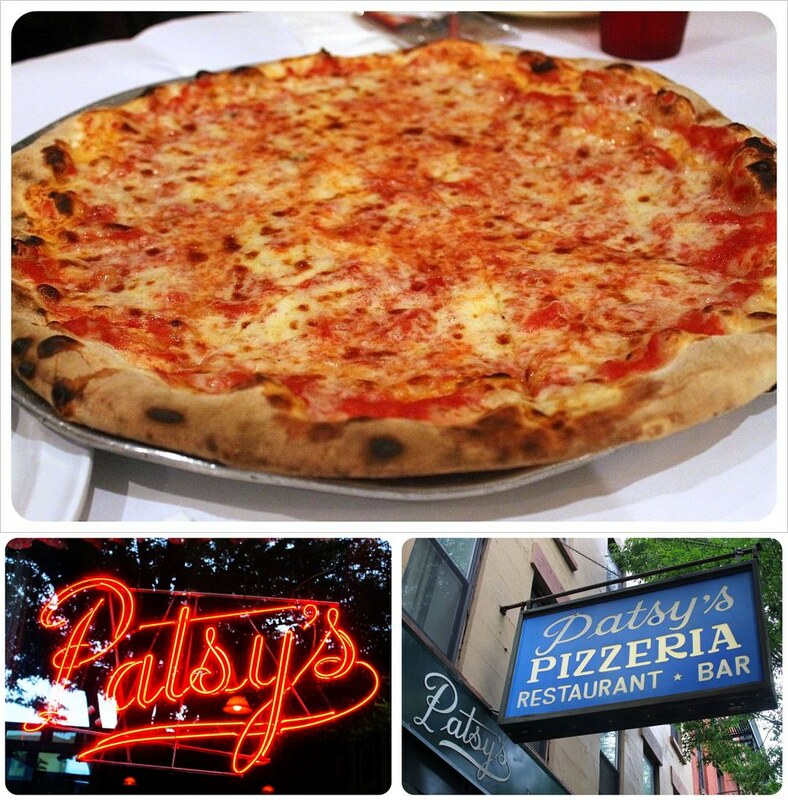 Patsy’s is another one of the original Neapolitan style coal fired oven pizzerias. Different from Lombardi’s or Grimaldi’s though, the mozzarella cheese here covers the entire pie which makes the pizza super cheesy (and delicious!). Tip: Every year in mid-August, Patsy’s celebrates its anniversary with Great Depression–era pricing: coal-oven pizzas for 60¢, 12-ounce steaks for 90¢ and sodas for 10¢. Verdict: Well worth the trip up to East Harlem and possibly our favorite pizza on the tour. Roberta’s is hands down the best pizza I’ve had in New York. There’s no question about that. Even though it is housed in what looks like a ramshackle building from the outside and is far out in Brooklyn, in Bushwick, it is so worth coming here! I totally understand why Beyonce and Jay-Z eat here regularly – I’d eat here every week, if I could. Absolutely scrumptious! 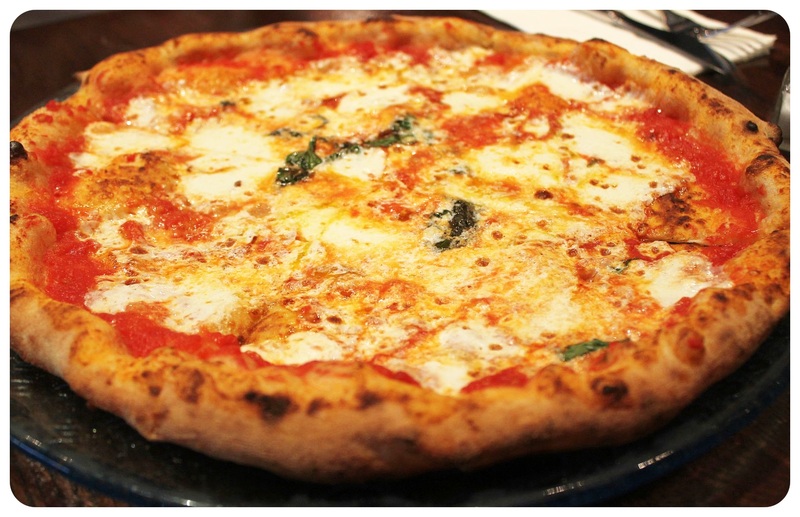 Bonus: Compared to some of the other famous pizza places in NYC, Roberta’s $12 Margherita is an absolute steal! Tip: If you want to skip the lines, come here for lunch. If you don’t want to make the trip out to Bushwick (even though it is so worth it!) and you happen to find yourself in New York in May or September, you’re lucky. Roberta’s usually has a stall at the month-long Madison Sq Eats food festival in Madison Square (right in front of the Flatiron Building). Verdict: Best pizza in New York, Dani voted. 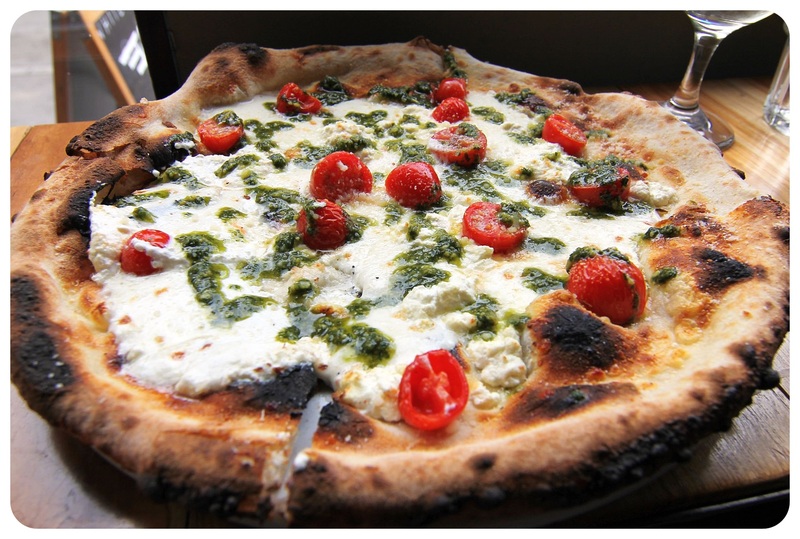 Ignore all the other pizza places in this list, make a beeline straight for Roberta’s. Stop reading this list now. Hop on the L Train, get off at Morgan Ave and it’s less than two minutes from the subway. Artichoke Basille is another favorite of mine, especially their artichoke pizza. On this pizza, you basically have an artichoke spinach dip instead of a tomato-based pizza sauce, but if this sounds weird to you, hear me out: it is absolutely amazing. Seriously one of the best pizza inventions out there! They have a number of other pizzas (Margarita, Vodka, etc), and because they all look fantastic, I find myself ordering some of the other slices here every now and again, as well. Stick to the artichoke pizza though, this is their signature pizza and it’s killer. Tip: There are three branches in Manhattan (plus one in Astoria, Queens). The East Village location is more like a hole-in-the-wall pick-up-a-slice place, while the Chelsea location is a full sit-down restaurant. Because of its location (right by the Highline Park and one block from Chelsea Market), the Chelsea location can get busy, but prepared for lines in the Greenwich Village and East Village branches, too. 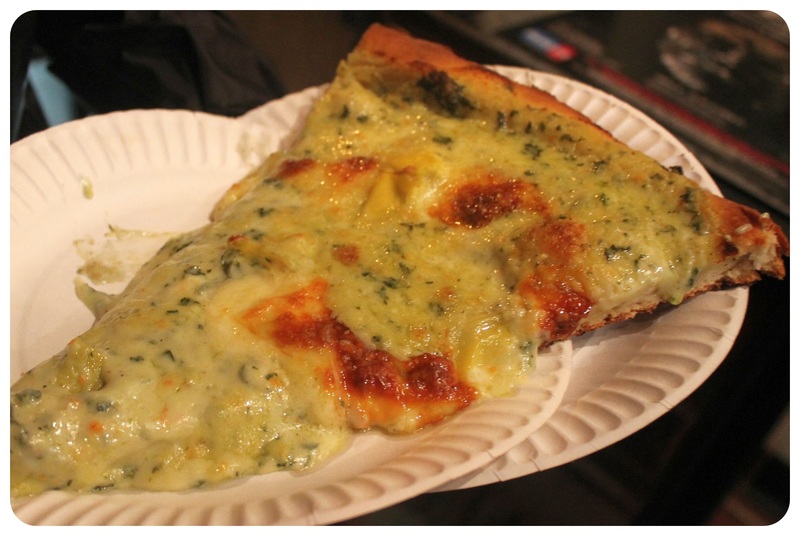 Verdict: The artichoke pizza is drool-worthy and one of my top five pizza slices in New York! Joe’s Pizza is a Greenwich institution, and perfectly located in midst of all the Village bars to lure you in after a drunken night out, to soak up some of that booze before you go to bed. Even though this is a 24-hour pizza slice parlor, it’s much more than a cure-your-hangover pizza place, it is probably the best slice you can get in the village. 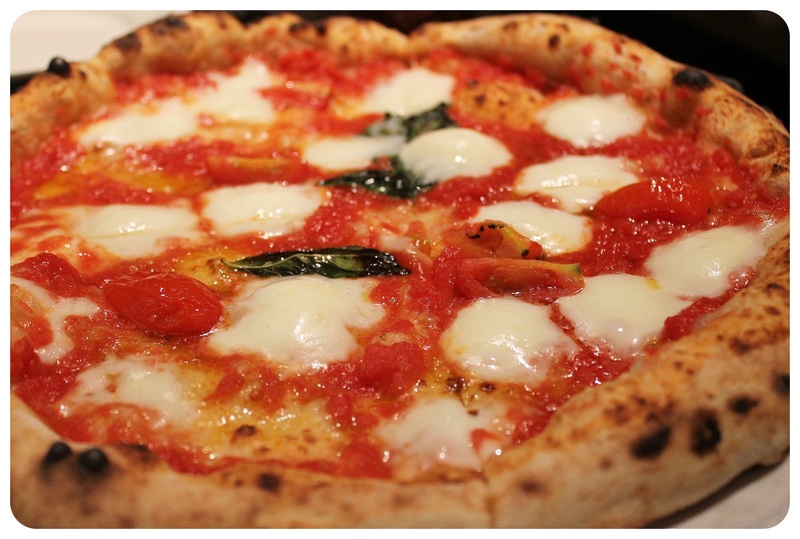 At $2.75 the margherita is slightly more expensive than a $1 slice, but so worth it. The cheese-sauce ratio is perfect – not too cheesy and not too saucy, and if you want a really really good slice, splurge on the $3.50 slice with fresh mozzarella. You’ll thank me later. 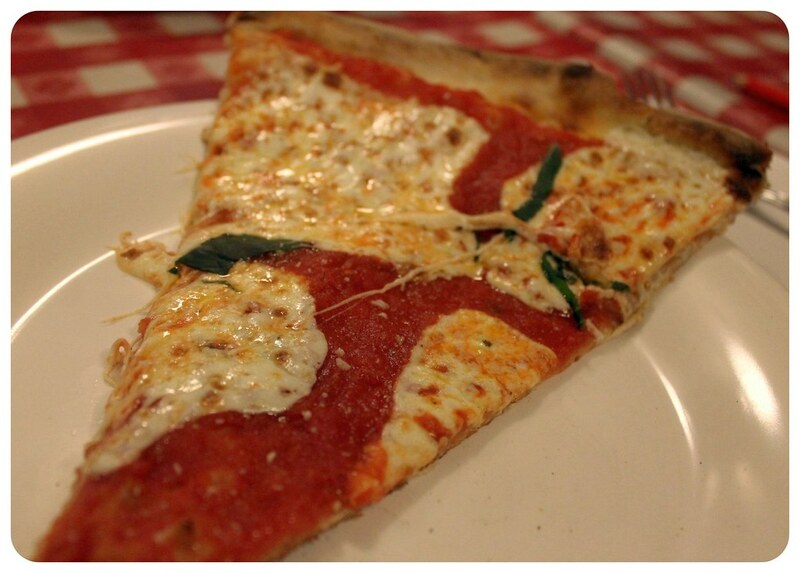 Tip: Don’t miss a slice of Joe’s on a trip to New York! Verdict: I can’t think of a better cheese slice in New York City! The only slice I’d put above this is the artichoke pizza at Artichoke Bastille, but their cheese slice isn’t anywhere near as good as Joe’s. Bleecker Street Pizza would be my #2 slice in the Village, but has been named ‘Best pizza in New York’ by the Food Network three years in the row. Since it’s only a 3-minute walk to Joe’s Bleecker Street location, you might as well try both and decide for yourself. Both have a long list of celebrity fans. I love the huge selection at Bleecker Street’s, making it always hard for me to decide which one to go for (or ending up with a slice more than I wanted! ), but starting at $3.50, they’re more expensive than Joe’s and I am not sure that the higher price tag is justified. 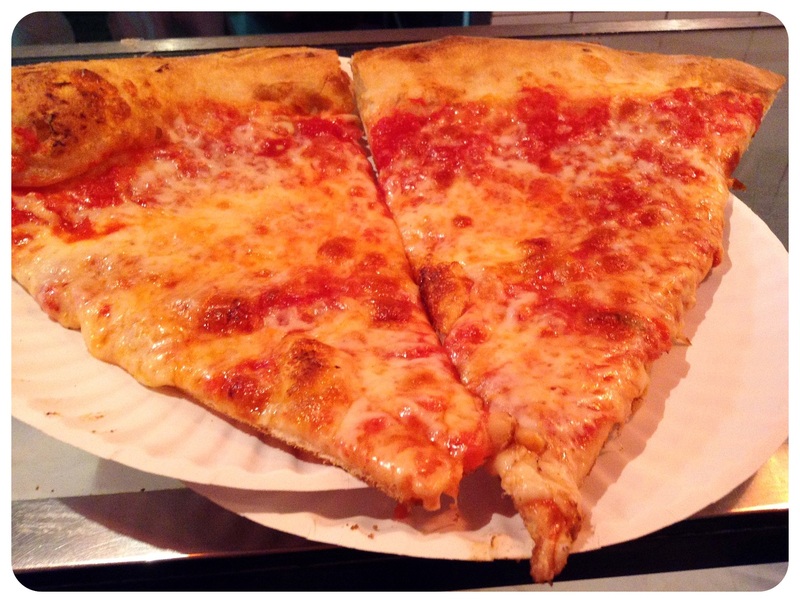 Tip: Combine a visit to Bleecker Street Pizza with a visit to Joe’s and compare! Verdict: One of New York’s best slices. When I planned a trip to the ‘true’ Little Italy of New York – in the Bronx, not on the Lower East Side, where the touristy Manhattan Little Italy is located – I started researching the best pizza place in the Arthur Avenue area right away. If there are true Italian restaurants here, there must be a true Naples-style pizza somewhere. My research led me to 089, or Otto Zero Nove, and it didn’t disappoint. 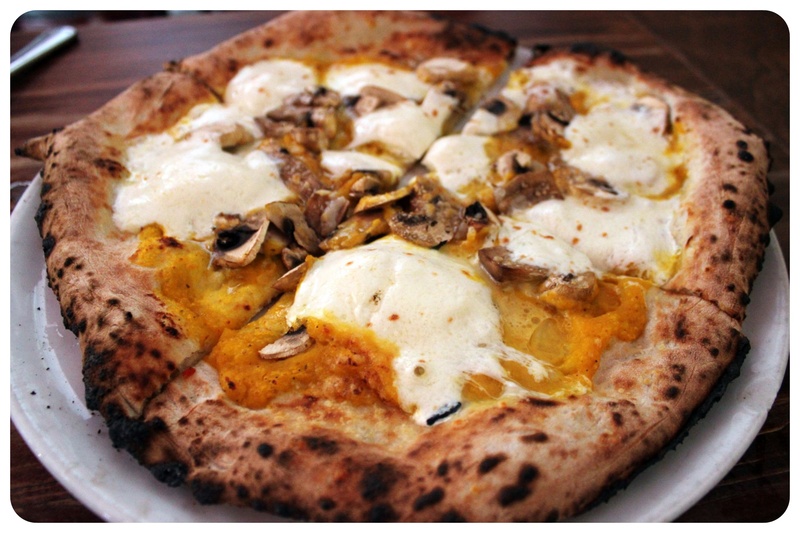 I opted for an unusual pizza choice: Pizza La Cirilo ($16.95), with butternut squash puree instead of a tomato-based pizza sauce, and topped with fresh mushrooms and fresh mozzarella, with truffle oil drizzled on top of everything. The pizza was absolutely divine! Tip: A solid choice if you are visiting the Bronx’ Little Italy. Many unusual pizzas on the menu (with potato, butternut squash puree, etc), and all ingredients are imported from Italy. Verdict: Who would’ve thought that the pizza had such good Italian-style pizza? Definitely worth visiting, would eat there again. Fornino’s is definitely not one of the most amazing pizza places in New York, but they make a decent pie and have a good lunch deal. Lunch, exactly. Because, their other problem is that they are in Williamsburg and in Greenpoint, and if you find yourself in Greenpoint at night, you should obviously go to Paulie Gee’s and if you find yourself in Williamsburg at night, you head to Best Pizza, no question. But if you are near one of their branches and you want to have a proper sit-down pizza lunch, it’s an excellent choice. I have only had the Margherita pizza (which was solid) so far but I’m keen on trying the ricotta eggplant pizza. Tip: Go for their lunch special: $12 for a pizza and a salad. Excellent value for money! Verdict: A decent Italian-style pizza and the lunch special is a fantastic bargain – I mean, look at the size of the pizza! To call your pizzeria simply ‘Best’ when you’re way out on the edges of a city famous for its pizza – now that’s daring. Here, in the capital of pizza, Best Pizza is still much more ‘underground’ than Underground Pizza mentioned above, that’s for sure. This well-kept secret only opened in 2010, and is located a couple of blocks up from popular Bedford Avenue in Williamsburg. It wasn’t just the adorable décor that impressed us – although we loved the white paper pizza plates, designed by customers, hanging all over the walls and ceiling. Best Pizza was actually able to win us over on a white pizza – which we usually do not enjoy – and we scarfed down slices with ricotta, shaved parmesan and caramelized onions with a sesame seed crust that made this pizza so so delicious. Tip: Get here before the secret gets out and this place will be crowded at any time of the day! Verdict: Was it the best? We’ll let you decide – but definitely a must for pizza peeps who like more than just a classic cheese slice. You know what the coolest thing about Scott’s Pizza Tour is? Beyond the fact that we drove to three different boroughs in a yellow school bus – Queens, Brooklyn, Lower Manhattan and Harlem in under four hours and got to eat slices at places that normally only serve whole pies – and you couldn’t eat four whole pizzas in a day – could you?! And even cooler than ‘backstage’ access inside the kitchens to learn possibly everything there is to know about making pizza and watching Scott use his own personal super high temperature pizza oven thermometer to test the actual temperatures of each of the pizza ovens. The best thing is that Scott goes to different pizza places each Sunday. This is a guy who samples pizza in nearby states on his days off, so of course he doesn’t want to get sick of places…if we wanted to do this tour again (and again), odds are we would continue to cross places off my list. Not only that, but he also offers a Greenwich Village Pizza Walk – which we’ll probably join next time we’re in town, too! This Italian-style pizzeria is in the middle of Greenwich Village, right on Bleecker Street (and in the vicinity of John’s Pizza and Bleecker Str Pizza!). Kesté’s oven was handmade from the lava clay of Vesuvius volcano near Naples, or so the story goes. The Pizza del Papa (with butternut squash cream, smoked mozzarella, red and yellow peppers, and zucchini) sounds like the perfect autumn dish, but I have only tried the wood-fired Margherita ($13) which hit the spot. Tip: Come here for a nice dinner, Keste is a bit fancier, and has a lot of specialty pizzas that are pricier than your usual pizza – worth it though, in my opinion. No slices, only full pies. Verdict: A proper Italian-style pizza in New York! Perfect. 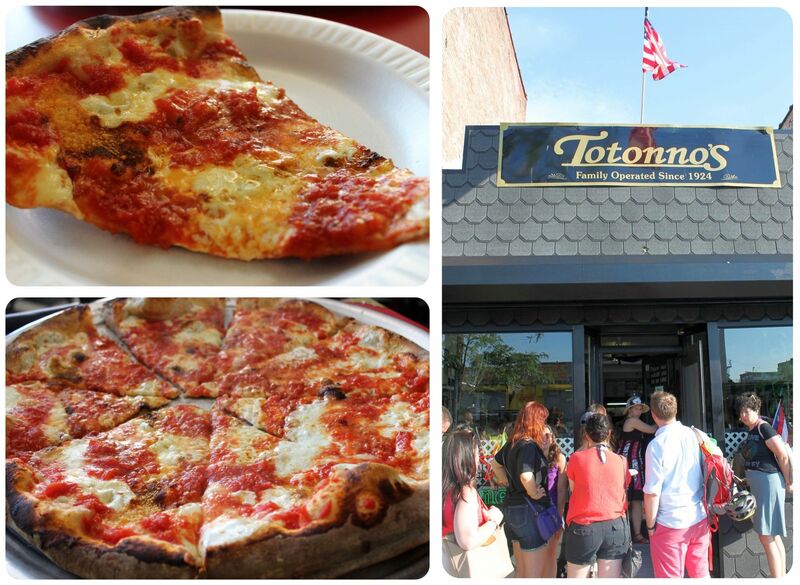 Totonno’s is a Coney Island institution, having served pizza on Neptune Avenue since 1924. This is another one of New York’s iconic coal fired brick oven pizzerias. Antonio “Totonno” Pero, the founder, worked at Lombardi’s first and once he had perfected his pizza-making skills, he decided to open his own place out in Coney Island. Totonno’s hasn’t changed their recipe since 1924 and is supposed to be one of the most quintessential New York pizzas, and hey, who doesn’t need to take the occasional trip out to Coney Island, anyway? Tip: Don’t ask for the menu – you can see all available pizzas on the board. Totonno’s only does full-size pies, no slices. Verdict: I must admit that I had expected more. It was a bit of a let-down, like the other much-hyped and Totonno-related Grimaldi’s, so I wouldn’t make the way all the way out to Coney Island just to eat at Totonno’s. If you’re planning to visit Coney Island anyway, for the amusement park or some beach time, then it’s well worth stopping here for a pizza. Don Antonio’s is right in the Theater District, just down the road from Times Square actually. I was skeptical. Could a place right in the middle of the tourist center of Manhattan be any good? It was surprisingly good. Not amazingly good, and the dough was a little too gooey for me, but the rest of the pizza was convincing and definitely authentic Naples-style pizza. 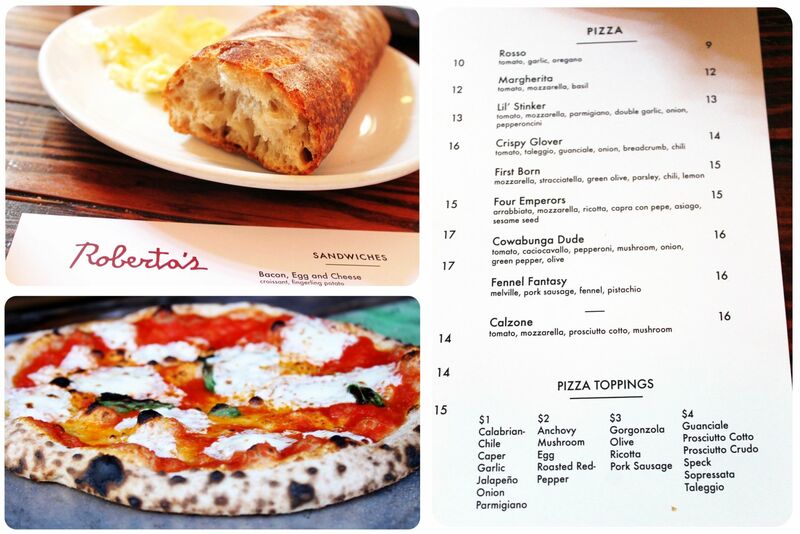 When I looked into who is behind Don Antonio’s, I found out that it was a joint venture of Roberto Caporuscio of Kesté Pizza & Vino (one of my favorites! ), and his maestro, Antonio Starita, of one of Naples’ oldest and most revered pizzerias, Pizzeria Starita a Materdei – so it shouldn’t come as a surprise that the pizza here is good. Tip: Make sure to come early if you are planning to dine here because it gets packed at night – you are in the Theater District after all. Verdict: It’s solid enough to be included in this list, and I’ve heard other people rave about it, plus it has very good reviews all over the interwebs. If you are not as much of a pizza snob as I am, you’ll probably enjoy it more than I did (to clarify: I did enjoy it, but it wouldn’t make my Top Ten list). I wasn’t sure if I could justify $5 for a slice of pizza (except for Artichoke Basille, where I always happily hand over a fiver), but since there are lines out the door at Di Fara’s (with waiting times of up to 1 – 2 hours) despite the price tag and the out-of-the-way location in Midwood, Brooklyn, I had to see f these slices lived up to the hype. Anthony Bourdain claims it’s the ‘best of the best’ and Di Fara’s keeps winning ‘Best Pizza of NYC’ awards by several food publications year after year. Domenico DiMarco, who opened the no-frills pizzeria in 1959, takes pride in using only imported ingredients from Italy. I finally made it to Di Fara’s in 2016, and nearly died of hunger while waiting in line for about an hour for my slice. Had I known that I’d be waiting that long, I would’ve ordered five slices. 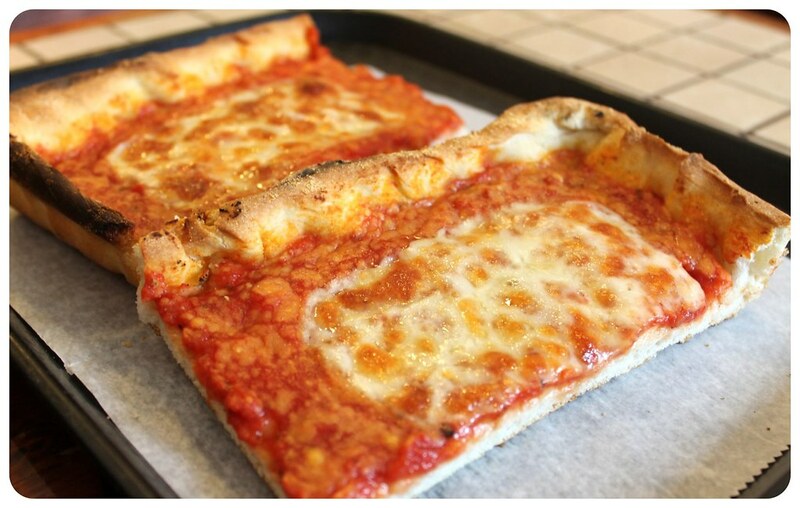 We tried the Sicilian style (thick dough, baked in a pan) as well as the regular pizza, and I thought both were perfect, but my friend found the Sicilian style pizza too oily. Tip: Di Fara’s was voted ‘Best Pizza in New York’ several times, by the likes of Zagat, Frommer’s, Anthony Bourdain and Mayor Bill DeBlasio. 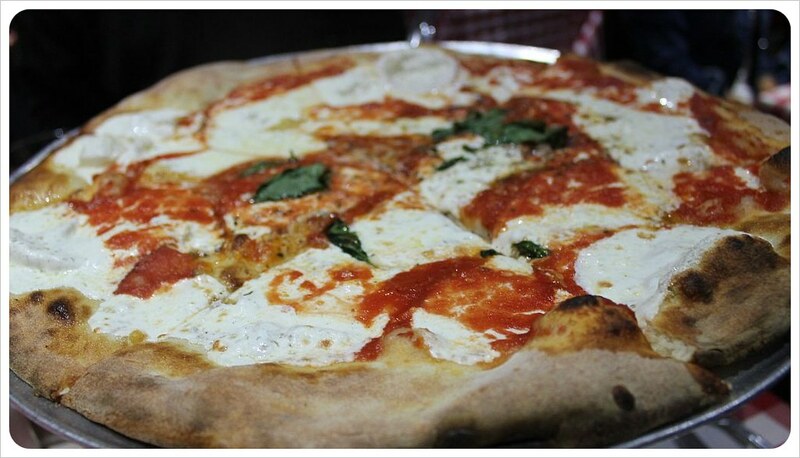 This pizza is worth the trek out to Midwood if you’re a true pizza lover! Verdict: Loved it! But I wouldn’t wait an hour again for a slice here. Unless I happen to be in the area maybe. I admit, this place is nowhere to be found on any of the ‘best slices in NYC’ lists, but if you are in the Financial District around Wall Street, in Battery Park or just returning from the Staten Island Ferry, Underground Pizza place is well worth a visit. 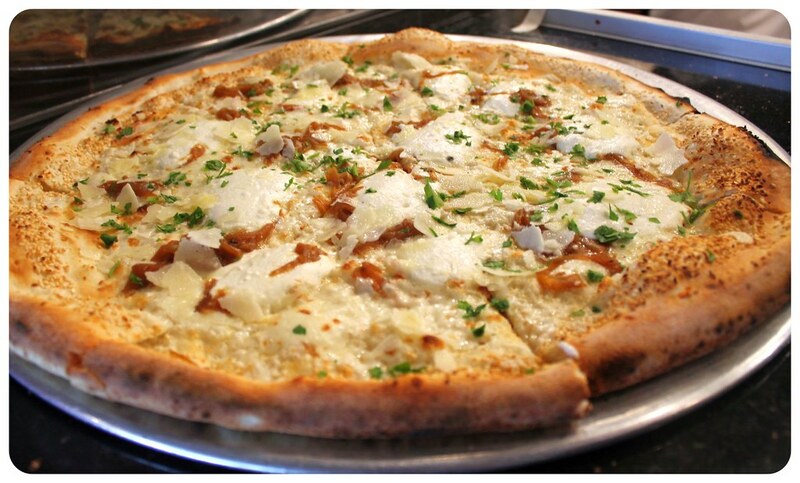 We had the eggplant parmigiano pizza on a couple of occasions, and it is so delicious. The classic Margarita style is also good, slices are start at $2.75, and you can even get a breakfast slice with cheese, eggs and either bacon or sausage if you like – but we haven’t made it down there early enough to try that just yet. Tip: Because this is in the Financial District, skip lunch hours or you’ll get stuck in long lines. Verdict: The eggplant parmigiano pizza hits the spot. 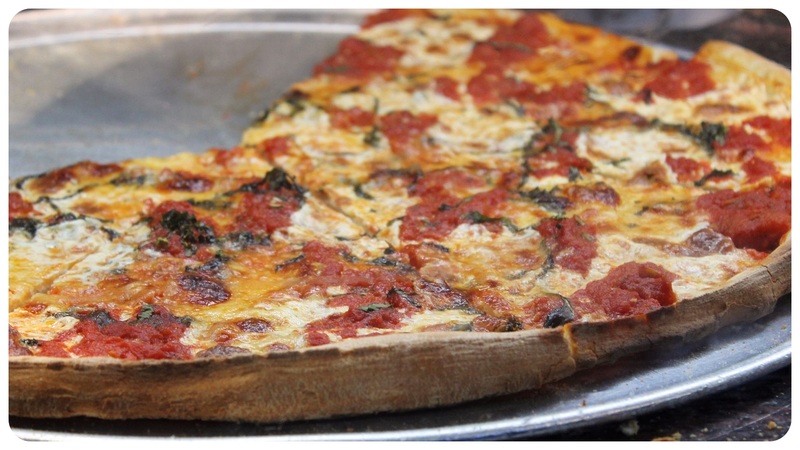 There you have it, my favorite pizza places in New York – so far! I will be updating this post every time I visit a new pizzeria in New York, so it just might be worth bookmarking this and checking back here as an ever-growing New York Pizza Resource. 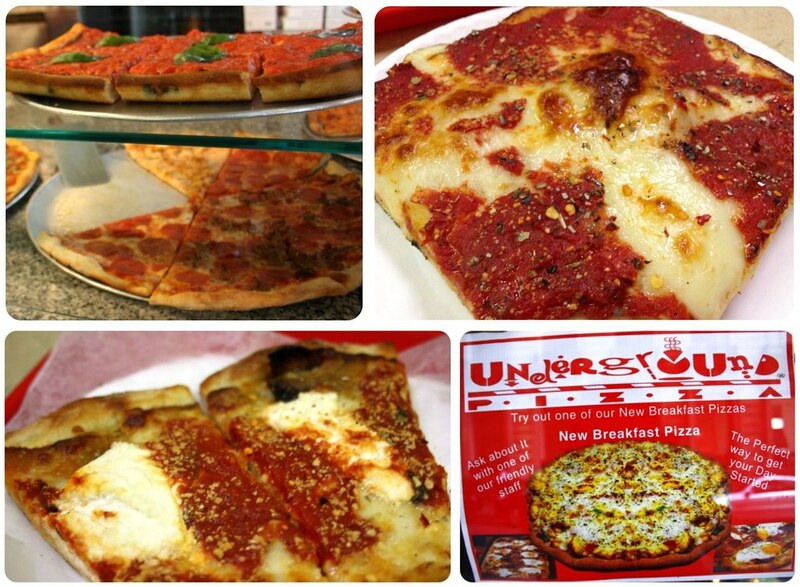 Do you have a favorite pizza place in New York City? Please share it in the comments below! I head back to NY in 4 months after 3 years of being away. I have been dreaming of a thin crust pizza that I can fold in half and devour for those entire three years. I cannot wait to stop at each and every one of these places. Thanks for the mouth watering list! Love it! We also have a new-found appreciation for artichokes and goat’s cheese. And as for pizza, I’ve eaten more of it since travelling than the whole of my life previously, and I love it more than ever! Julia- that is so true!! Although I have to admit that we used to have pizza at least once a week when we were still living in London, so our pizza consumption actually went down. But it’s a great go-to food anywhere in the world! I hope you had pizza for lunch? 😉 I got so hungry when I put the post together and am still craving pizza!! Hi Dany, This is a great piece, which I’m going to bookmark for my next visit to NYC. But did you try Best Pizza in Williamsburg? It was amazing, and a really cool place. The 20-inch pie costs just $18 and easily feeds two hungry people. ah yes, in my haste to post a comment I didn’t see that you did visit Best Pizza! Glad you enjoyed it too. I can totally understand that – the excitement about wanting to share something 😉 And Best Pizza was truly delicious! I want to try their Margarita pizza next time we’re in Williamsburg, that one also looked good! Lucali in Carroll Gardens, Brooklyn. http://www.yelp.com/biz/lucali-brooklyn-3 Tiny place (bring your own bottle). They make pizza by candlelight. And the more upscale, expensive but utterly delicious Otto in Manhattan. http://www.ottopizzeria.com/lunch_dinner.cfm. I agree on your Grimalidi’s take–doesn’t quite meet the hype! Perfect timing! This past weekend I was thinking I needed to research pizza places for an upcoming trip to NYC! On previous trips I’ve tried Grimaldi’s and Luzzo’s (which was great!) but I’ve never had a really good pizza slice so these are some great places to check out! Thanks! Hi Cassie, glad to hear that you’re about to have some New York pizza! 🙂 You’ll have to let us know which one you tried and how you liked it!! Hey Dani – try Cafe Viva on 2nd Ave in the East Village or on Broadway up around 97th st ish. That’s my favorite. They have vegetarian and vegan options and it’s by the slice. Cool fun fact about Totonno’s – go there early because they don’t have regular hours. Every day they make the dough fresh and once it has run out for the day, that’s it. They close again until the next day. You forgot Joe’s Pizza in Greenwich Village! We love that place. Leonardo DiCaprio is a fan too, apparently. They only use two ingredients on their slices – cheese and tomato. Somehow this manages to taste amazing. Hi Carmen, Joe’s was actually #11 on my list but then I took it out for some reason! 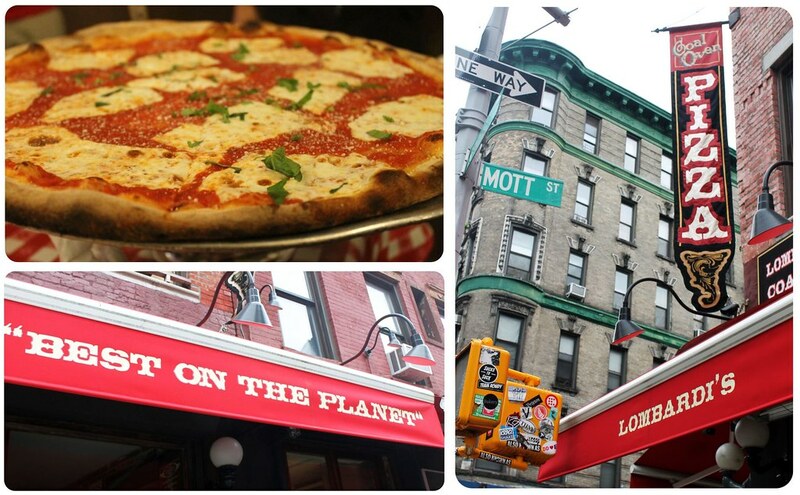 Good to know that it’s worth a visit though – It looks like we’ll have to go on the Greenwich Village pizza walk next time we’re in New York to fit in as many places as possible 🙂 I am craving pizza!! I am literally salivating right now looking at these photos! I’ve been to Lombardi’s, and the combination of their pizza and sangria, it was delicious! OMG, I love the look of the pizza bagels. I recently found the best pizza in Phnom Penh-aftr 2 years there! It is a moto with a pizza oven on top and is called ‘Katy Perri’s Pizza’. Not only is the name awesome, but the pizza is delicious too. It’s as if this post was written just for us! We’ve had a similar goal and will check off more on our next visit. 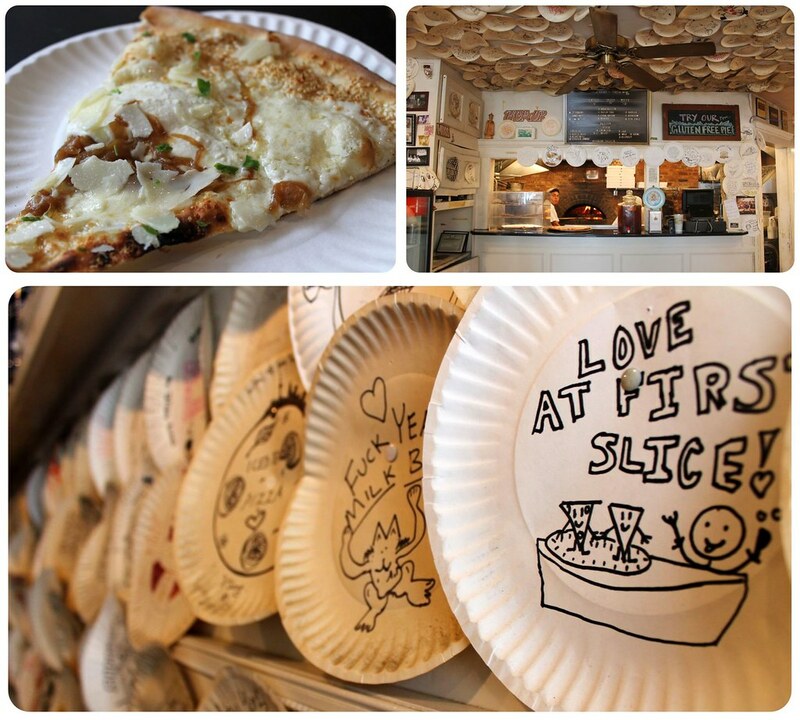 We love those $1 slices! I’ve tried out some of the places you mention. But I found my favorite by chance, just a couple of days ago: Savoia on Smith Street in Carroll Gardens, Brooklyn, I had Pizza Campagnola there, with wild mushrooms, sausage and Ricotta and it was awesome. 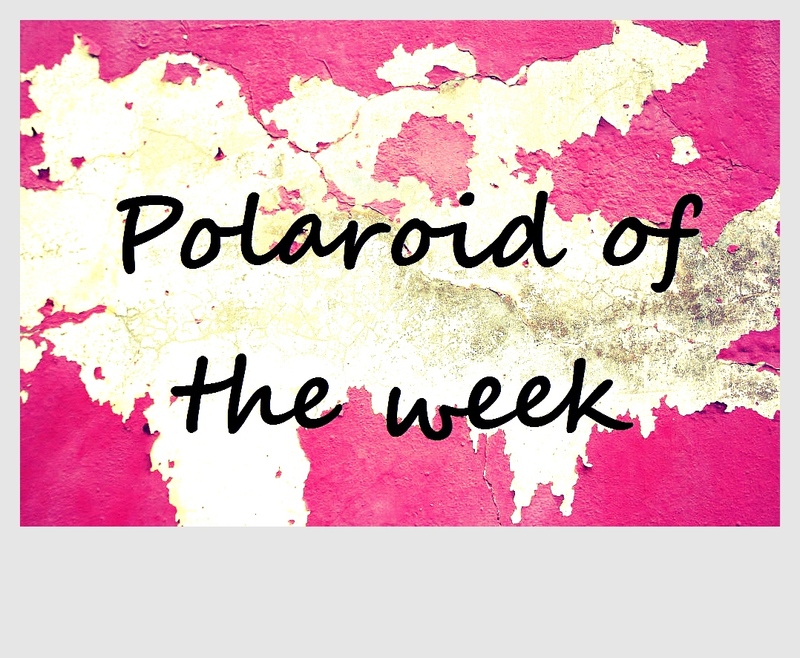 Omg I love love your blog!!! Especially this section!!! Pizza!!! And vegan!! Spunto Thin Crust Pizza in the West Village, New York is amazing. On week days you can buy slices. I had the Salciccia Dolce and a costum designed pizza and they were both perfect. So you can get artichoke and goats cheese on the pizza if you choose to custom design one 😉 I’ve been there twice and it doesn’t seem to be crowded. 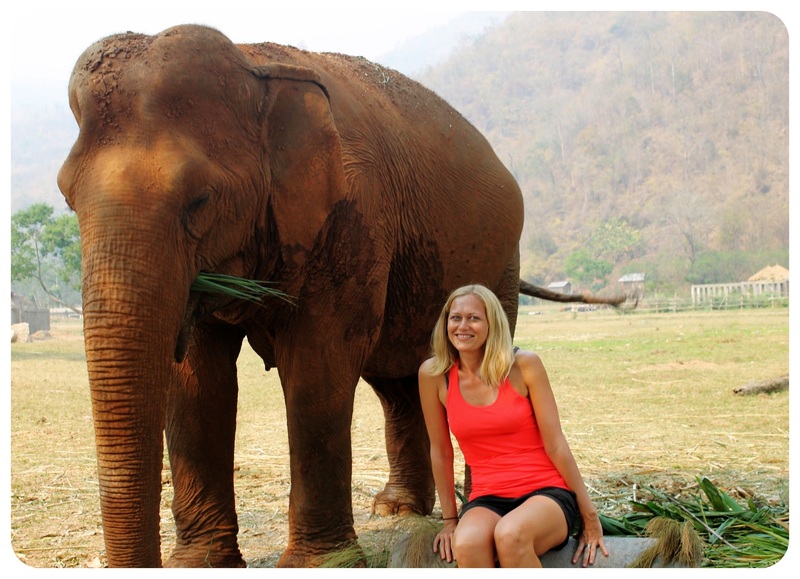 Louise, thanks so much for sharing! We’ll definitely head there next time we’re in NYC! The artichoke and goats cheese pizza sounds delicious!! Yummy! That looks so good. I like to cook my pizzas on a stone to get the crust evenly baked and crispy. That’s what makes the perfect pizza. New York City Attractions: Which ones are worth a visit, which ones should you skip?